They claim to relieve stress and wrap you in a giant hug. Here's what an expert says—and what you should know before you buy. It was just about a year ago that a weighted blanket took the crowdfunding world by storm: In 2017, more than 23,000 donors contributed nearly $5 million to the Kickstarter campaign for the Gravity Blanket, a low-tech but high-end product designed to "harnesses the power of deep-touch stimulation." 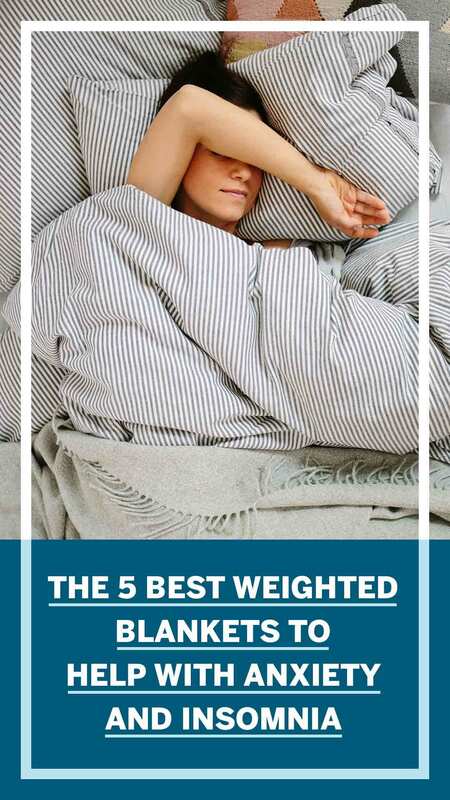 Weighted blankets are exactly what they sound like: Basically, they’re comforters with tiny pellets or metal chains woven throughout, so that weight is distributed across the body when a person lies underneath them. According to the Gravity Blanket’s original Kickstarter campaign, these blankets can be used "to treat a variety of ailments, including insomnia, post-traumatic stress disorder, obsessive-compulsive disorder, attention deficit hyperactivity disorder, as well as circumstantial stress and prolonged anxiety." Since then, weighted blankets have seen a big jump in popularity—and a quick glance at their online reviews shows that plenty of people really do rely on them to help with conditions like anxiety and insomnia. But there’s a catch: Kickstarter later asked Gravity Blanket to tone down the language about "treating" specific conditions, and some sections were eventually removed from the brand’s page. On its own website, the blanket is now advertised with less specific claims about improving mood, reducing stress, and promoting restful sleep. So what’s the real story here? Could a weighted blanket really be the answer to your sleep or anxiety problems? It might be worth a try, says Jeneane Solz, PhD, an instructor of psychology at Columbia University Medical Center—but there are a few things you should know before making a purchase. First, says Solz, there aren’t a lot of studies to back up weighted-blanket claims. "Most of the research on these products has been on people with developmental disorders, like children with autism," she notes. "And from those studies, we’re finding that there aren’t significant differences in terms of objective measures like how quickly kids fall asleep and the total time they spend asleep." What those studies do show, however, is that participants who use weighted blankets "seem to like it better than a regular blanket," says Solz. "It can feel nice and luxurious—like a big hug—and that may be helpful for some people." A few small studies have looked at the effect weighted blankets have on anxiety and insomnia in adults. A 2015 study in the Journal of Sleep Medicine & Disorders, for example, found that participants’ sleep time increased and nighttime movement decreased when they used weighted blankets compared with regular blankets. They also reported that it was easier to settle down to sleep with the weighted blanket, and that they felt more refreshed in the morning. In 2006, a 32-person study in Occupational Therapy in Mental Health found that 63% of participants reported lower anxiety after using a weighted blanket (compared to lying down with no blanket at all), and 78% said they felt more relaxed with the blanket than without. That study also found that weighted-blanket use was safe for healthy adults, having no effect on vital signs like pulse and blood pressure. If you want to try a weighted blanket, read online reviews first and look for features that you think will help you relax, says Solz: Maybe material softness or breathability is important, or maybe you want a blanket with built-in aromatherapy to evoke a spa-like environment, for example. "A lot of us carry around anxiety and can have trouble sleeping, so it’s important to have healthy coping habits you can turn to when you’re stressed," she says. "You might do deep breathing or take a hot shower or cozy up in your favorite sweater, and a weighted blanket might be another part of that arsenal." Weighted blankets shouldn’t be a substitute for proven therapies for anxiety or insomnia, says Solz—and if you’re currently in treatment for a mental health condition, get the okay from your doctor or therapist before buying one. "For some, like people with panic disorders or agoraphobia, the sensation of a weighted blanket could have a counter-effect and make anxiety even worse," says Solz. Ready to give them a try? Here are a few highly-rated options you can buy online and have delivered to your door. Now fully funded and available for delivery in 7 to 10 business days, the Gravity Blanket comes in 15-, 20-, and 25-pound versions, each measuring 4 feet by 6 feet. (King and queen sizes are in the works, but the company recommends the blankets not be shared by couples who might disrupt each other's sleep, since using one is supposed to be a "grounding" experience.) It’s made of breathable fabrics, and both the weighted inner layer and outer duvet cover are machine washable. This 47-by-74-inch cotton blanket comes in 15-pound or 20-pound models, with a polyester microfiber cover that one Amazon reviewer described as so soft it "feels like I’m petting a bunny." Tiny plastic pellets are distributed evenly across the blanket in stitched pockets, which gives it a stylish, quilted look. At 60 by 80 inches, this plush blanket fits a queen size bed and weighs 12 pounds. (If you want more or less weight, the company suggests sleeping under half the blanket or doubling it up on top of you.) One side has a silky smooth minky polyester fabric, while the other side features a textured dot pattern "for fingers and hands that like to fidget." YnM makes blankets in various sizes and weights, ranging from 5 pounds (38 by 48 inches) to 25 pounds (80 by 87 inches). It’s made of 100% cotton and is filled with tiny glass beads; for easy cleaning, a duvet cover can be purchased separately. Despite the smaller size options, the instructions state not to use these blankets “on your little ones or people who can’t move the heavy blanket themselves"—a warning that should be heeded for all brands of weighted blankets. These made-in-the-USA blankets come in 11 different size-and-weight combinations, and a variety of fabrics including cotton and flannel. Their most popular fabric, however, is their polyester chenille fabric—with super-soft fibers long enough to run your fingers through. One Amazon reviewer wrote that the blanket "literally relaxes every part of your body," and it "feels like you are being swaddled to sleep."